Most men eventually develop some type of prostate problem, and when they do there are usually no easy solutions. 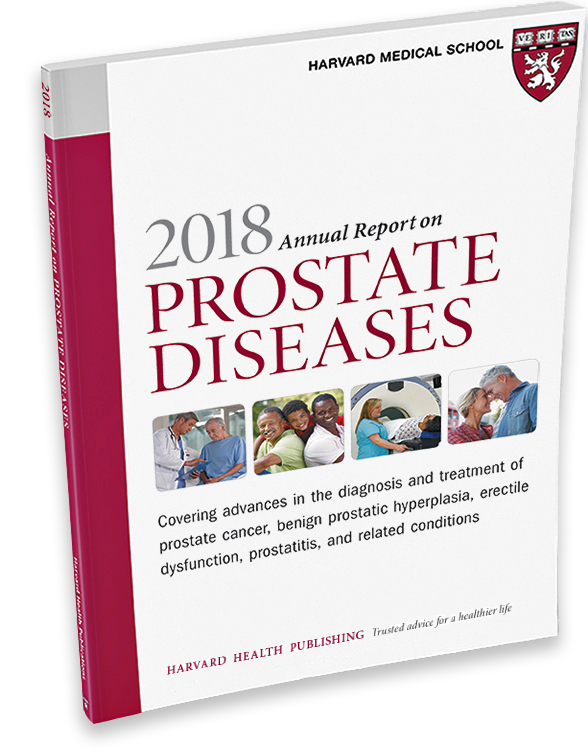 More than a primer on prostate conditions, this Special Health Report, the Annual Report on Prostate Diseases, includes roundtable discussions with experts at the forefront of prostate research, interviews with men about their treatment decisions, and the latest thinking on complementary therapies. This report will provide you with the information you need to understand the current controversies, avoid common pitfalls, and work with your doctor to make informed choices about your prostate health. "What can I eat to reduce my risk of developing prostate cancer?" This is one of the most common questions physicians hear from men concerned about prostate health. Undoubtedly, many hope that their doctor will rattle off a list of foods guaranteed to shield them from disease. Although some foods have been linked with reduced risk of prostate cancer, proof that they really work is lacking, at least for now. Eat at least five servings of fruits and vegetables every day. Go for those with deep, bright color. Choose whole-grain bread instead of white bread, and choose whole-grain pasta and cereals. Limit your consumption of red meat, including beef, pork, lamb, and goat, and processed meats, such as bologna and hot dogs. Fish, skinless poultry, beans, and eggs are healthier sources of protein. Choose healthful fats, such as olive oil, nuts (almonds, walnuts, pecans), and avocados. Limit saturated fats from dairy and other animal products. Avoid partially hydrogenated fats (trans fats), which are in many fast foods and packaged foods. Avoid sugar-sweetened drinks, such as sodas and many fruit juices. Eat sweets as an occasional treat. Cut down on salt. Choose foods low in sodium by reading and comparing food labels. Limit the use of canned, processed, and frozen foods. Watch portion sizes. Eat slowly, and stop eating when you are full. Based on questionnaires completed by more than 30,000 men in the Health Professionals Follow-up Study, researchers found an inverse relationship between physical activity and BPH symptoms. Simply put, men who were more physically active were less likely to suffer from BPH. Even low- to moderate-intensity physical activity, such as walking regularly at a moderate pace, yielded benefits. Using data from the Health Professionals Follow-up Study, researchers also examined the relationship between erectile dysfunction (ED) and exercise. They found that men who ran for an hour and a half or did three hours of rigorous outdoor work per week were 20% less likely to develop ED than those who didn't exercise at all. More physical activity conferred a greater benefit. Interestingly, regardless of the level of exercise, men who were overweight or obese had a greater risk of ED than men with an ideal body mass index, or BMI. Get more information and the latest news about prostate health at www.HarvardProstateKnowledge.org. Can vitamin D levels signal aggressive prostate cancer?